The 32-mile long barrier island known as Galveston is believed to be over 5,000 years old. The earliest residents to live on its beaches were the Karankawa, a Native American tribe that spanned the entire Gulf Coast, estimated to be here as early as the 1400s. Cabeza de Vaca was rumored to have marooned here in 1520, and of course, Galveston’s most infamous celebrity Jean Lafitte, arrived in 1817. When Texas was annexed into the United States in 1845, the city began its growth as a center of commerce and immigration, and its soft beaches and calm, warm waters emerged as the ‘Playground of the South’. 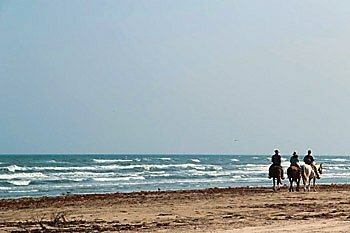 Today, from one end to the other, the beaches of Galveston Island, whether private or public, offer a range of beachfront experiences as varied as the historic tales that are buried in the sand. East Beach is Galveston’s bonus beach, created by accident during the development of Galveston’s port and harbor in the nineteenth century. In an attempt to shift the currents and subsequently deepen the harbor, the Corps of Engineers built a series of jetties off the eastern tip of the Island. Over time, the silt and sand did shift but it also began to accrete along the man-made jetties. When the seawall was extended east along the coastline from the original construction that ended at 6th Street, the accretion continued and was eventually filled in by the efforts of an early 20th century organization called the East-end Flats Improvement Committee. 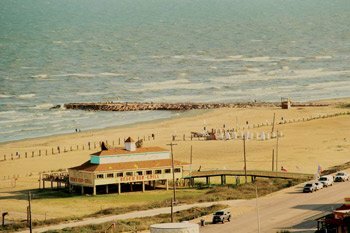 Now easily considered not only the most beautiful but the hippest of Galveston’s beaches, East Beach is the largest beach in Texas, located at the far eastern end of the Island. During the off-season it offers a quiet, peaceful retreat from the confines of the seawall, and is known for its spectacular fishing and bird-watching. But the summer months see it come alive with what it is famous for: concerts, festivals, events, an annual sandcastle competition sponsored by the American Institute of Architects, and parties that last from dusk until dawn. Unlike most beaches on Galveston, alcohol is allowed on East Beach, although glass containers are prohibited. East Beach just celebrated its Grand Re-Opening on Memorial Day Weekend, where it debuted over 1.5 million dollars worth of improvements. The new boardwalk, entertainment stage, and pavilion will play host to a free concert series on the second, third, and fourth Sunday afternoons of May through September. 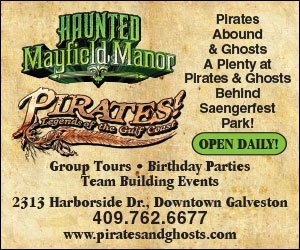 For more information on the schedule of events and the line-up, visit www.galveston.com. 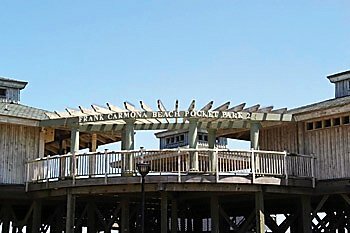 After recovering from a rather sordid reputation in the 1980s and 90s, Stewart Beach has emerged as Galveston’s favorite beach park for families. Clean and safe, alcohol is prohibited and it offers tons of family-friendly amenities. Easy parking, chair and umbrella rentals, boogieboardrentals, volleyball courts, restrooms, showers, a souvenir shop, and a snack bar combine all the fun of a beach day with comfort and convenience. Lifeguards and security are fully-staffed during the peak season. Stewart Beach holds special events and functions throughout the summer, such as volleyball tournaments and sandcastle building competitions. The Stewart Beach Community Room is available for rental for private parties, receptions, and other functions, and outside catering is allowed. In the 1950s Henry Porretto, known affectionately as “The Big Kahuna,” had a vision for a safe and clean beach environment that offered activities for families and adults. He established Porretto Beach originally as an extension of Porretto’s Motel and Beach Shop/Coffee Shop; it was an all-inclusive resort-style attraction that allowed visitors to stay and play on the beach. It continues to operate as a family business sixty years later. Sonya Poretto and her two children Alex and Nikki strive to carry on the legacy begun by “The Big Kahuna,” and continue to operate Porretto Beach as a beautiful, easilyaccessible, and family-friendly addendum to any Galveston beach vacation. A wide variety of food and concessions are available to Poretto Beach-goers, as a number of the surrounding restaurants will deliver straight to your beach chair. Restaurant lists and menus are available, and keep an eye out for the ice cream and snocone trucks that make their way regularly through the sand. To supplement your fun in the sun, Porretto rents umbrellas, beach chairs, jetskis, and floats. Washrooms are also on site. Traveling westward down Galveston’s shoreline, the seawall ends, and the sites of a bustling beachtown fade into the serenity of open plains and million dollar beach homes. It is along this stretch of San Luis Pass Road that the Island reveals her innate duality; downtown, tourists are amazed at the magnitude of 19th-century architecture that has survived over one hundred years and countless onslaughts from Mother Nature. But out here, where the dunes roll right into the prairie, one gets the sense that the Island is much older than her monuments. The cries of Karakawa echo, the tales of LaFitte’s buried treasure ring in the ears, and one can imagine what Galveston looked like before it was Galveston. 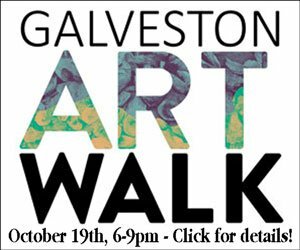 Scattered amid these ancient histories that are now only remembered, are three Pocket Parks, operated by Galveston Parks and Recreation. Sea Gull Shores Beach, Sand Castle Beach, and Sea Shell Beach each cover over ten acres of sparkling Gulf shoreline, and offer easy access to and from the water. Sea Shell offers parking , but the pavilion is currently closed due to damage from Hurricane Ike in 2008. Sea Gull Shores offers beachfront parking. Sand Castle is the most well-equipped for a beach adventure. It includes an educational wetlands preserve, outdoor showers, and umbrella and chair rentals. Sea Gull Shores Beach Pocket Park 1 – 11102 San Luis Pass Rd. at 7 1/2 Mile Rd. Sand Castle Beach Pocket Park 2 – 11745 San Luis Pass Rd. 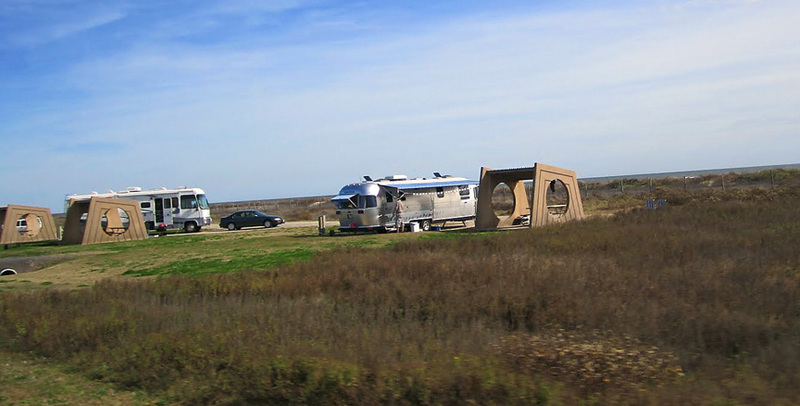 Galveston Island State Park was opened in 1975 after it was acquired by Texas Parks and Wildlife from private owners. It spans over 2,000 acres and a menagerie of coastal wildlife finds refuge in the untouched wetlands. 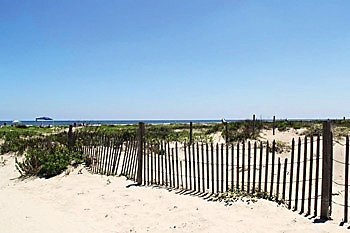 Barrier islands, such as Galveston, and the wetlands that surround them play a vital role in the perpetuation of Gulf marine life, the resiliency of dunes along the beaches, and the survival of the Gulf ecosystem. Birds from all over the world touch down in this park during the spring and fall migration periods to join an array of armadillos, raccoons, rabbits, trout, drum, and flounder who all make their home in this corner of coastal preservation. 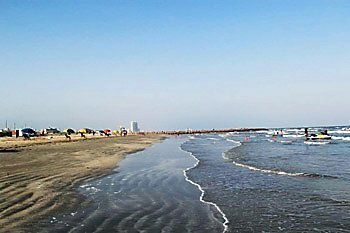 Stretching from shore to harbor, Galveston Island State Park offers the best of both the beach and the bay. Play in the sand, swim in the sea, or take a hike along miles of trails and boardwalks ripe with opportunities for candid photographs by the nature lover. The State Park also provides a variety of campsites at incredibly reasonable rates, either with electricity or without. Fishing tips, tour maps, rates and reservations are available on the Texas Parks and Wildlife website. The beach referred to as San Luis Pass is actually named for the stretch of water that both separates Galveston’s western tip from the mainland and connects Galveston Bay to the Gulf of Mexico. Historically, San Luis Pass was a popular “back door” to the island for pirates and smugglers. Due to the shallow depth of the inlet, however, the beach along it was often the location where many ill-fated crews ran aground, straight into the hands of unwelcoming Karankawa or the men of the menacing Jean Lafitte. Today, the beach at San Luis Pass is still located off the beaten path, and offers no amenities except the peace of isolation and solitude. Surfing and fishing are permitted year round, and along the Pass are several launch sites into the Gulf. Swimming is allowed only on the Gulf side, and although no permanent lifeguards are stationed, security and lifeguards do patrol the area during the summer. Alcohol is prohibited, but vehicle access to the beach is entirely free and reaches all the way to the water’s edge. The Galveston side of San Luis Pass is a public beach located at the far western tip of the Island. The entrance is marked by signs and can be found just before the entrance onto the Galveston Tollbridge. San Luis Pass County Park is located over the toll bridge in Freeport, TX. 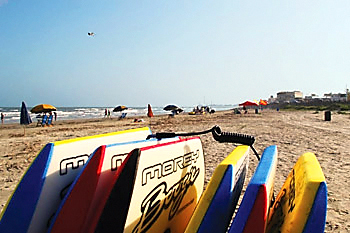 With its white sand beaches and freshwater lagoons, Palm Beach has offered Galveston Island visitors a scenic, family-friendly escape to cool off since 1988. Discover a more interactive experience with the addition of the fun Lazy River and a giant Tower Slide! Now you can delight in the major enhancements that have been made to Galveston’s only white sand beach. You can now bask in the sun on soft beaches plus be surrounded with the lush, exotic landscaping. You can also enjoy a game of beach volleyball on the regulation sand volleyball courts. Either way, you’re in for an unforgettable day at the beach. Lazy River: A 650-linear-foot Lazy River offers over 60 interactive points at which guests on shore can splash and spray as their friends float by along the Lazy River course. Wave Pool: A 6,100-square-foot zero entry Wave Pool graduates to a depth of 5 feet to appeal to a variety of ages. Tower Slides: Two 18-foot enclosed Tower Slides offer a thrilling plunge of refreshment. Please note there is minimun 48” height requirement. Splashpad: Automated dump buckets, spray arches and fountains. No water depth. Aquarium Adventure: Playground, which includes eight-feet-tall climb-on platforms, 25-foot Hydro Storm tower with a 500-gallon water dump bucket and more. Coolers and outside food and drinks are not allowed inside Palm Beach. Lockers, concession stands and a gift shop are also available. Palm Beach admission is Adult: $23.95; children (4-12): $17.95; senior (65+): $17.95. While there is a lot to do in Galveston, it’s a place where it feels comfortable to do little. At 10.4 miles long, the seawall lining the Gulf of Mexico is the world’s longest continuous sidewalk and attracts walkers, joggers, bicyclists, surfers, sunbathers, skaters and sightseers year-round. It’s a great place to exercise or just sit to watch a flock of brown pelicans skim across the waves at sunset. 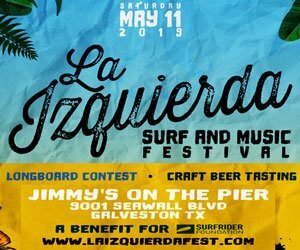 But if you would like to see some local surfers, the city of Galveston has designated certain areas of the beach for that purpose. They include the beaches between the 17th Street & 21st St.; between the 25th Street & 29th St.; between the 29th Street & 53rd St.; 300 feet west of 61st Street, and west of 91st Street.